I am considering changing my annual Defensive Player of the Year Award to the "Rivera Award," to honor Rivera, who is arguably one of the best defensive players to ever play in the league. As a junior Rivera tallied 125 tackles and took home first team all-state honors. He improved as a senior collecting 149 tackles and once again taking home first team all-state honors. To this day I haven't seen as good of a linebacker in the league, or state for that matter, as what I witnessed from Rivera in 2003. Check out his highlights from his days at SM Northwest if you aren't convinced. Whitaker is sometimes overlooked when the legends from Olathe North are brought up, but that won't happen here. The heart and soul of the Eagles defense in 2001, Whitaker totaled 125 tackles (63 solo) for a defensive unit that gave up a mere 5.4 points a game and recorded five shutouts en route to winning the 6A state championship. Dyer was a physical freak to say the least. On the wrestling mat he was a three-time state champion and he went on to wrestle in college at Oklahoma. On the football field he was one of the best linebackers in the league's history and he put up incredible numbers. As a sophomore he racked up 173 tackles, then he followed that up by making 117 tackles as a junior. He added 62 tackles as a senior, but much of the drop off was because he was promoted to quarterback midway through the season and it took away from his time on defense. Lawrence made quite a name for himself with his torpedo-like hits that he dished out in his two primary seasons as a starter (2005-2006). In those two years he accumulated 150 tackles, six sacks, four forced fumbles and three interceptions. 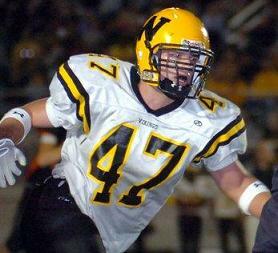 He was also a stellar quarterback and he was a Simone Award finalist in 2006. Lawrence went on to play linebacker at Nebraska, but his collegiate career was cut short after a series of concussions. In his senior year at SM West he was featured in Sports Illustrated's "Faces in the Crowd" with this accompanying highlight video. While McAnderson went on to be a solid running back at the University of Kansas, many figured he'd play linebacker at the collegiate level following an outstanding high school career as a middle linebacker. McAnderson was a First Team All-Sunflower League performer as a linebacker and a running back in both his junior and senior seasons. As a senior he also garnered first team all-state honors as a linebacker after posting 132 tackles and leading Lawrence to a 8-3 record. 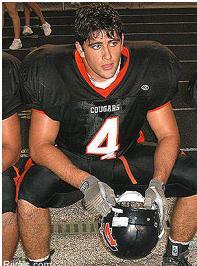 Ritzman was one of the few players since 2000 to have accumulated over 300 tackles during his high school career. He earned a starting spot as SM West's "Mike" linebacker in the early part of the 2005 season and he held the title for the rest of his career with the Vikings. During that time period he helped SM West to a 26-7 record. All told he racked up 324 tackles, caused four fumbles, made three sacks and snagged three interceptions in his three seasons as a starter. Quite a few members of Lawrence High's class of 2006 football team are remembered following the team's 10-2 campaign, but it is Penny who is most remembered as the standout on the defensive side of the football. During the Chesty Lions' 12-game 2005 season, Penny recorded 144 tackles to lead the league. His efforts earned him first team all-state honors. Swartz helped lead Olathe North to state title appearances in 2009 and 2010. As a senior in 2010 he totaled 148 tackles with three fumble recoveries, two sacks and an interception from his middle linebacker position. His interception came against Olathe South in the Sectional Round of the playoffs and it enabled Olathe North to score a quick touchdown and advance to the Sub-State game that year. He was named first team all-state following the conclusion of the season. Walker is developing into one of the best linebacker in the Big XII at Kansas State, but before his time as a Wildcat he was a great linebacker for Olathe North. As a senior he teamed up with Kyle Swartz to create one of the most formidable linebacker units in the state. Walker used his size and speed in coverage where he recorded five interceptions while also supporting the run from his outside linebacker position. 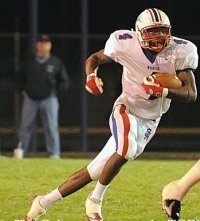 He was a first team all-state selection as a senior. Scott was a three-year starter for SM West, spending his first two seasons at the "Will" position before moving over to the "Mike" slot as a senior to fill the void left by Ritzman. In his final two seasons as a starter he posted 153 tackles, five sacks and one interception. His efforts as a senior were good enough to earn him first team all-state honors and offers from several of the FBS service academies.